There was a period before Christmas where we had a lot of snow accumulation on the ground. Some rain over the holidays, followed up by this warm stretch, melted off most of it, and the receding snow can reveal some interesting things that take place under the snow layers, where we can’t see them. One that many homeowners are probably familiar with are these strange half-tunnels carved into grassy lawns. Only an inch or two wide, they can carve intricate networks or simple purposeful trails into the grass and soil which many people find unsightly and can often be difficult to fill in again. The culprit, at least here in the east, is the common and widespread Meadow Vole. It’s the only species of vole that occurs in eastern North America, but it’s also found as far west as Alaska. It doesn’t usually come into homes, so like most rodents, it’s rarely seen itself. However, it leaves ample evidence of its presence. 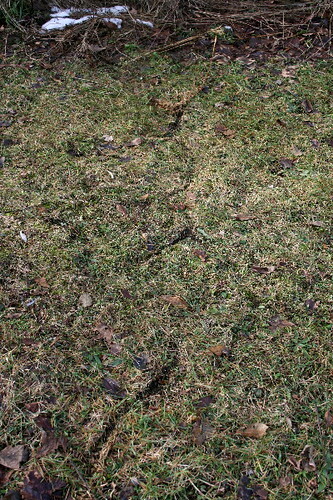 The trails in the lawn are a network of pathways that the vole uses to travel between its burrow, where it sleeps and stores food, and the food itself. 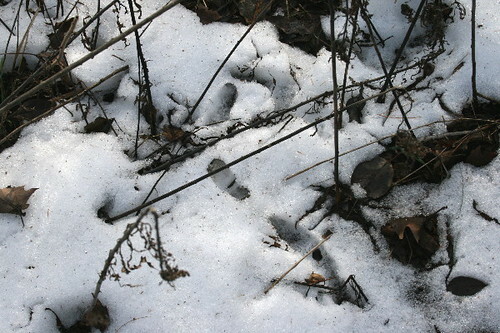 In the winter the voles travel under the snow, rather than over it, for three reasons. The first is to avoid predation. It’s much easier for an owl or a fox looking for a meal to track a rodent running across the snow than it is to find something underneath the snow (although these predators are adept at doing that as well!). Also, given the excellent insulative properties of snow, it’s much warmer underneath it all than above it, where the little vole would be exposed to wind and cold. This makes it much easier for the vole to remain active during the winter. And thirdly, it provides much easier access to its food sources. In the winter, voles will eat seeds and grasses, which are usually found close to the ground, as well as roots and the bark of young saplings. If you have birdfeeders out you might chance to spot one munching on fallen seed when snow cover is low, but more likely the evidence of feeding you’re likely to come across is finding a sapling stripped of bark around its base. Munching by voles can be differentiated from that of rabbits (who will also chew the bark from saplings) in that rabbits won’t usually chew all the way to the ground, and the pattern of gnawing by voles isn’t uniform. I didn’t notice any such saplings around these particular trails. 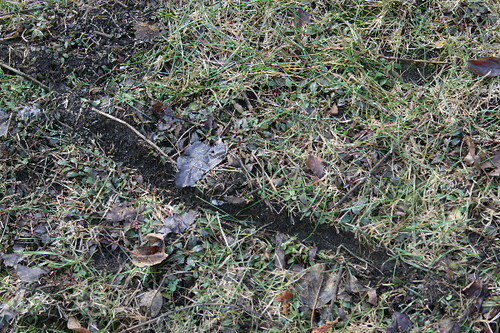 Once the snow melts, you can also often see little piles of grass clippings within the trails, where the vole has snipped the grass off at the base, pulled it down, snipped off some more, etc, until it can reach the seed heads. This long trail was crossing a narrow stretch of lawn between two naturalized patches (a group of sumacs to a couple of wild apple trees). I’m not sure if the voles are actively foraging for roots or seeds when making these trails, or if they’re directionally challenged (or perhaps just sleepy? ), but it seemed like a very curvy trail for just going from one place to another. Perhaps it’s a mechanism to throw off predators listening to rodents running under the snow cover? Surprisingly, there weren’t very many trails on the lawn, just these couple. In the winter, voles often nest communally in groups of anywhere from two to a number of generations . Female voles breed for the first time when about half grown, at about 25 days. They breed nearly continuously, mating again immediately after giving birth to a litter, and can have three to six litters (depending on latitude and food resources) of four to seven young in a year, which would quickly become quite a large group! Most individuals live less than a year, however. I suppose larger groups would be likely to make a broader network of trails, and a pair would probably just have a handful of well-used trails. A colony of voles can occupy a territory of up to 100 feet in diameter.